Martin Boyd is one of my all-time favourite writers: an Anglo-Australian born in Switzerland, he is one of only a few writers to capture the ambivalence of belonging in neither homeland yet intensely fond of both. His novels all feature the upper-class world of British privilege and its Australian offshoots, yet Boyd has a strong empathy for those of a different class. 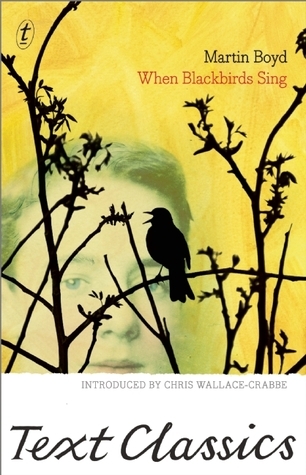 And in this novel When Blackbirds Sing there is yet another contradiction: he is anti-war yet not a pacifist. When Blackbirds Sing (1962) is the fourth in The Langton Quartet, preceded by The Cardboard Crown (1952); A Difficult Young Man (1955); and Outbreak of Love (1957). The novels, which can be read independently of each other, explore the lives of the Langton family, loosely based on Boyd’s own remarkable family, described as a cultural dynasty in the Text Classics introduction by Chris Wallace-Crabbe. (See Brenda Niall’s splendid biography, The Boyds: A Family Biography). The dynasty included the great painter Arthur Boyd (1920-1999), and the influential architect Robin Boyd (1919-1971), as well as other noted painters, potters, and architects. But it was Martin Boyd who was the writer. In the period before he actually enlists, Dominic enjoys the contented routines of life in the county and he falls in love with the England he knew as a boy. He feels such a strong sense of belonging in the landscape that he alarms Helena with a letter suggesting that they move back to the ancestral home, currently rented out as a consequence of his father’s financial difficulties. Neither of these two young marrieds are very good at expressing their love for each other in correspondence, but Helena has been writing letters full of vivid detail about the farm so that Dominic always knows what he is fighting for. She is mildly anxious about some gossip she has heard about a shipboard companion, and alert to any mention of the former fiancé Sylvia, but she is confident that Dominic loves her. As indeed he does. He was desolate en route and spent the entire voyage in an anguish relieved only by his innocent friendship with the widowed Mrs Heseltine. The English interlude over, the scene then shifts to Béthune in Northern France. En route Dominic makes his first friend, Hollis, younger and more naïve than Dominic. They become comrades-in-arms, Dominic feeling as if he has taken the younger man under his protection, which includes protecting him from the vulgarity of the other officers about women. As the action intensifies, Dominic’s outsider status isn’t just because of his ‘colonial’ status, it’s also because his moral values are different and his outrage is provoked by issues that don’t bother men who think less deeply. I had thought I was tired of books about the First World War. But the sophistication of this novel meshes so perfectly with the heartfelt story that it tells. When Blackbirds Sing well deserves its place on my shelves. Well there’s one for my TBR. A Difficult Young Man was at the centre of the books I read for my matric and was very influential, particularly as I went from a country high school to mixing (awkwardly!) with Geelong and Melbourne Grammar boys at uni. Yes, I think I can predict with some confidence that you would like this one. I never realised Arthur and Martin were related. Of course now it makes sense. What a talented family. This book sounds pretty interesting but I too am tired of WWI and WWI I stories. They are generally so sad. This does sound different. *deep breath* This one is different because Boyd was passionately against this particular war once he saw how pointless it was, and because the focus is actually on the moral growth of his main character. Your reviews are always so thorough, Lisa. This book sounds like another I’d love. I haven’t yet tired of reading books on WWI and WWII, but I love history, and I love reading books set in Europe. I also don’t watch TV, and I doubt I’ve read anywhere near as many books on the topic as you! I’m totally in awe of the Boyd family, too. PS. I added the pencil sharpening scene yesterday—I so hope it gets published and I can thank you for it! Isn’t it interesting that in our f2f life people like us who don’t watch TV much are weird and strange but here in the virtual world of books we are completely normal? I love that. I read A Cardboard Crown a couple of years ago and loved it. He really does capture that feeling of not quite belonging in either England or Australia. I do hope to read the rest in the series at some point. This one sounds terrific. The Cardboard Crown is my favourite of his. One of the few books I have that weathers re-reading….